At least seven people have died in a fire which occurred in the capital’s southeast in an underground garage on Tuesday 13 January. “Bodies of seven victims have been found during the extinguishing of a fire which had arisen in the underground garage complex that was still under construction”, Yevgeny Bobylev, the head of the press-service of the capital department of the Ministry of Emergency Measures reported. All victims were citizens of Tajikistan, the first deputy of the chief of the State Fire Service Victor Klimkin has told. The garage is located under a 25-storeyed house. According to RIA-Novosti more than a hundred Tajik citizens lived there. “About 20 self-made ‘rooms’ were arranged for the residing of the workers. Combustible materials and electric heaters were used there”, the representative of the police told RIA-Novosti. A total of ten people were supposedly inside the garage when the fire set in, informs Interfax, referring to a source from the capital law enforcement bodies. The fire services received the message about the fire at 10:53 Moscow time (7:53 GMT). The first fire units arrived on the scene after six minutes. By 11:50 (8:50 GMT) the fire had spread along 50 square metres of floor space which corresponds to the second level of complexity on a five-point scale regarding fire intensity. 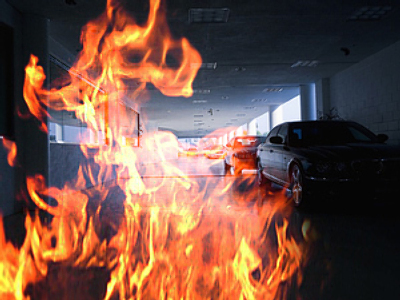 Later the fire covered 150 square metres of the garage’s floor space. At 13:12 Moscow time (10:12 GMT) the fire has been localized. As Yevgeny Bobylev informed, the rescuers found two people, one of which was injured. 20 fire-fighting crews and one search and rescue group worked on the scene. Now inspectors from the Public Prosecutor’s office are working at the scene of the incident. The representative of the Ministry of Emergency Measures has underlined the fact that fire security supervision of this project was in the compliance with Rosstroinadzor (the State Building Supervision Service), and not with the State Fire Supervision Service at the Ministry of Emergency Measures. According to the current Building code, since January 1 2007, fire security supervision on buildings under construction is not included into the competence of the State Fire Supervision Service.